This page attempts to record what is known about the origin and history of methods of cooking or boiling water etc in paper pans or kettles. Please contact me if you know any of this information is incorrect or if you have any other information that should be added. Thank you. There are entries still to be added to this page. 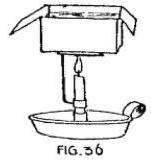 'Paper Magic' by Will Blyth, which was first published by C Arthur Pearson in London in 1920, shows how the Junk Box can be used as a saucepan to boil water over a candle.